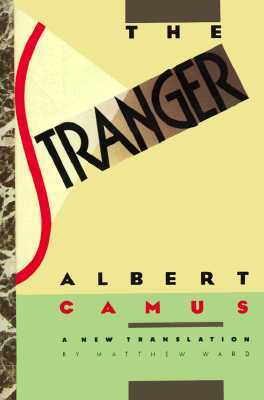 Since it was first published in English, in 1946, Albert Camus's extraordinary first novel, The Stranger (L'Etranger), has had a profound impact on millions of American readers. Through this story of an ordinary man who unwittingly gets drawn into a senseless murder on a sun-drenched Algerian beach, Camus was exploring what he termed "the nakedness of man faced with the absurd." Now, in an illuminating new American translation (the only English version available for more than forty years was done by a British translator), the original intent of The Stranger is made more immediate, as Matthew Ward captures in exact and lucid language precisely what Camus said and how he said it, thus giving this haunting novel a new life for generations to come. Albert Camus, son of a working-class family, was born in Algeria in 1913. He spent the early years of his life in North Africa, where he worked at Various jobs -- in the weather bureau, in an automobile-accessory firm, in a shipping company -- to help pay for his courses at the University of Algiers. He then turned to journalism as a career. His report on the unhappy state of the Muslims of the Kabylie region aroused the Algerian government to action and brought him public notice. From 1935 to 1938 he ran the Theatre de L'Equipe, a theatrical company that produced plays by Malraux, Gide, Synge, Dostoevski, and others. During World War II he was one of the leading writers of the French Resistance and editor of Combat, then an important underground newspaper. Camus was always very active in the theater, and several of his plays have been published and produced. His fiction, including The Stranger, The Plague, The Fall, and Exile and the Kingdom; his philosophical essays, The Myth of Sisyphus and The Rebel; and his plays have assured his preeminent position in modern French letters. In 1957 Camus was awarded the Nobel Prize for Literature. His sudden death on January 4, 1960, cut short the career of one of the most important literary figures of the Western world when he was at the very summit of his powers. Born in Algeria in 1913, Albert Camus published "The Stranger"-now one of the most widely read novels of this century-in 1942. Celebrated in intellectual circles, Camus was awarded the Nobel Prize for Literature in 1957. On January 4, 1960, he was killed in a car accident.